The storm began when a powerful solar flare erupted on the sun Monday (Jan. 23), blasting a stream of charged particles toward Earth. This electromagnetic burst, called a coronal mass ejection (CME), hit Earth at about 9:31 a.m. EST (1430 GMT), according to scientists at the Space Weather Center at NASA’s Goddard Space Flight Center in Greenbelt, Md. When a coronal mass ejection hits Earth, it can trigger potentially harmful geomagnetic storms as the charged particles and the fields within it interact with the planet’s magnetic field lines. This can amp up normal displays of Earth’s auroras (also known as the northern and southern lights), but a strong CME aimed directly at Earth can also cause disruptions to satellites in orbit, as well as power grids and communications infrastructures on the ground. “It’s not as big as some of the big, historic storms, but the chance for re-intensification is still possible because this active spot on the sun that created the initial havoc could go off again,” he explained. 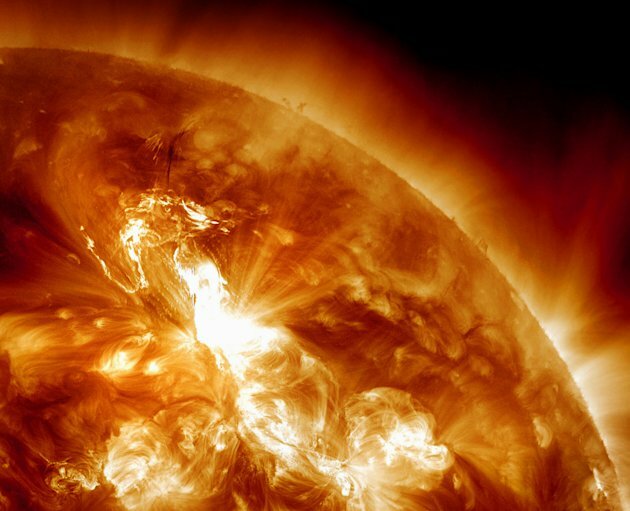 Several NASA satellites, including the Solar Dynamics Observatory , the Solar Heliospheric Observatory (SOHO), and the Stereo spacecraft observed the massive sun storm. Data from these spacecraft were combined to help scientists create models to calculate when and where the CME was going to hit Earth. Yesterday’s solar flare was rated an M9-class eruption, which placed it teetering on the edge of being an X-class flare, the most powerful type of solar storm . M-class sun storms are powerful but mid-range, while C-class flares are weaker. The sun’s activity waxes and wanes on an 11-year cycle. The star is currently in the midst of Solar Cycle 24, and activity is expected to continue ramping up toward the solar maximum in 2013. Editor’s note: If you snap an amazing photo of the auroras sparked by the solar storm, or other skywatching image, and would like to share it for a possible story or gallery, please contact managing editor Tariq Malik at tmalik@space.com. You can follow SPACE.com staff writer Denise Chow on Twitter @denisechow . Follow SPACE.com for the latest in space science and exploration news on Twitter @Spacedotcom and on Facebook . To view the article on Yahoo.com, please click here.